This is the third and final installment in a series on “Lost Parks” in Minneapolis. (If you missed them, here are Part I and Part II.) These are park properties that once existed, but did not survive as parks. There is a quiz question at the end of this article. It’s very hard. St. Anthony Parkway (partial). In 1931, the park board swapped the recently completed portion of St. Anthony Parkway from the southern tip of Gross Golf Course to East Hennepin Avenue for the land on which Ridgway Parkway was built from the golf course to Stinson Parkway. The park board gained 19 acres of land in the deal and the entire cost of constructing Ridgway Parkway was also paid. This story of the parkway “diversion” will be told in greater detail some day. It was controversial. (Read the broad outlines of the diversion of St. Anthony Parkway.) Some people have claimed that the diversion of St. Anthony Parkway is one reason for the “Missing Link” in the Grand Rounds. But that link had gone missing long before the “diversion” and wouldn’t have been found with or without the diversion. Sheridan Field. University Avenue NE and Twelfth Avenue NE, 1.25 acres. The park board purchased the half-block of land across the street from Sheridan School for $7,000 in 1912. At the park board’s request, Twelfth Avenue was vacated between the school and park. The new playground was provided with a backstop for a baseball field and a warming house for ice-skating, but few other improvements were made. In the early 1920s park superintendent Theodore Wirth urged the park board to either expand the playground or abandon it. He believed the site was too small. It was “inadequate,” he wrote, to provide for the “large attendance (it) constantly attracts.” In the 1924 annual report Wirth presented a plan for the enlargement and development of the park, but that was the last mention of the possibility of expanding the playground. A new, much larger Sheridan School was built on the site in 1932, and the following year the park board granted the school board permission to use the park as a playground for the school, provided that all maintenance and improvements would be the responsibility of the school board. It wasn’t until 1953 that the park board officially abandoned the site. In a land swap with the school board, the park board gave up the under-sized Sheridan Park for the site of the former Trudeau School at Ninth Avenue SE and Fourth Street SE. The park at the Trudeau site became Elwell Field II. Snyder Triangle. Fifth Avenue South and Grant Street, 0.06 acre. Purchased by resolution January 15, 1916 for $4,578. The park board had considered and rejected buying the triangle in 1886. The park was named for Simon P. Snyder, a real estate agent who once owned much of the land in the area. 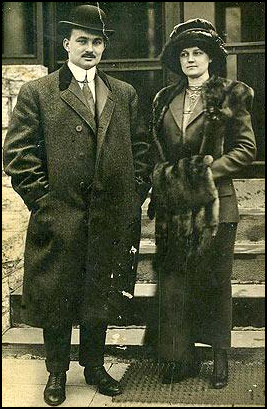 As Patrick Dea pointed out in a comment several months ago, Simon Snyder’s grandson, John Pillsbury Snyder, was a 24-year-old first-class passenger on the maiden voyage of the Titanic in 1912. He and his bride, Nelle Stevenson, were returning from their honeymoon — and survived. The triangle named for his grandfather did not. It was lost to freeway construction for I-35W. A triangle park exists today very near the old location, but it’s not owned by the park board. In 1967 the park board offered to help the state highway department landscape the new triangle between I-35W entrance and exit ramps and 10th Street. The old Snyder Triangle appears to be partly under the Grant Park building on Grant Street. I have not found a record of the price the little triangle fetched. Stevens Circle. Portland Avenue and 6th Avenue South, 0.06 acre. The small park was named for Col. John Stevens in 1893, but at that time it was named Stevens Place. The name was changed to Stevens Circle on August 1, 1928. From its acquisition in 1885 to 1893 the property was called Portland Avenue Triangle. It is not known if a change in the shape of the park prompted the name change from triangle to place to circle. The park was transferred to the park board from the city council in 1885 according to park inventory lists, although there is no record of the transfer in park board proceedings. The only indication of park board ownership of the triangle was an entry in the expenditures of the park board for 1885 for “Triangle, Portland Avenue and Grant Street” in the amount of $1.50. 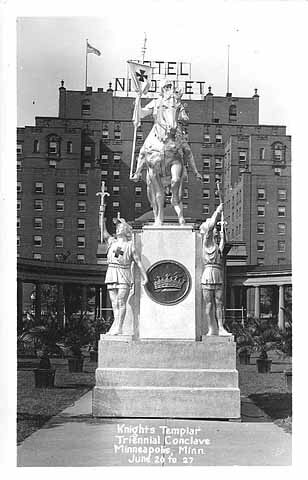 The triangle became the home of a statue of Col. Stevens in 1911. 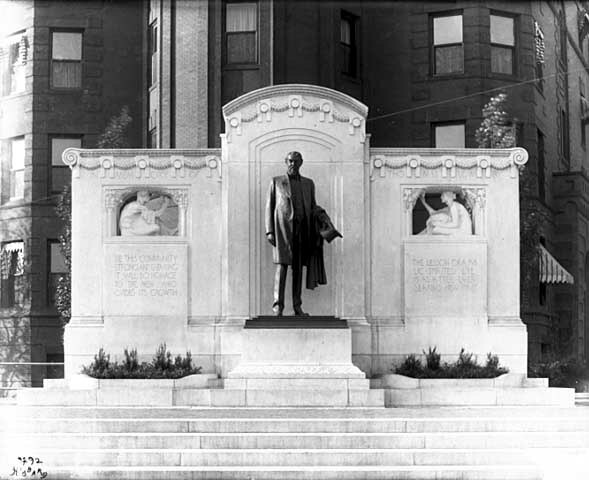 The circle was given back to the city for traffic purposes in 1935, at which time the statue of Col. Stevens was moved to Minnehaha Park and placed near the Stevens House. Stinson Boulevard (partial). From East Hennepin to Highway 8. 24 acres. A section of the boulevard was given to the city in 1962 because functionally it was a business thoroughfare, not a parkway. The section given to the city included all of the original land donated for a boulevard by James Stinson et al in 1885. It’s good we still have some Stinson Parkway remaining, because as I explained in the history of Stinson Parkway on the park board’s website, I think Stinson Parkway helped keep alive the plans of Horace Cleveland for a parkway that encircled the city. Without Stinson’s generosity, we might not have the Grand Rounds today. Svea Triangle. Riverside Avenue and South 8th Street, 0.09 acre. The first mention of the triangle is in the minutes of the park board’s meeting of May 3, 1890 when the board received a request that it improve the triangle. The problem was that the park board didn’t own it. So, on June 27, 1890 the city council voted to turn over the triangle to the park board. The land had been donated to the city in 1883 by Thomas Lowry and William McNair and their wives for park purposes. The triangle was reportedly named on December 27, 1893 to honor Swedish immigrants who had settled in the neighborhood. It had previously been known simply as Riverside Avenue Triangle. The triangle was traded to the city council in 2011 in exchange for a permanent easement between Xerxes Avenue North and the shore of Ryan Lake in the northwestern corner of Minneapolis. The city council requested the exchange when making improvements to Riverside Avenue. Svea Triangle is the most recent park lost. Vineland Triangle. Vineland Place and Bryant Avenue South, 0.05 acre. Transferred to the park board from the city council, May 10, 1912. The triangle was paved over in a reconfiguration of the street past the Guthrie and Walker entrances in 1973, but remains on the park board’s inventory. Virginia Triangle. Hennepin, Lyndale and Groveland avenues, 0.167 acre. The triangle was apparently named for the Virginia Apartments adjacent to the triangle. 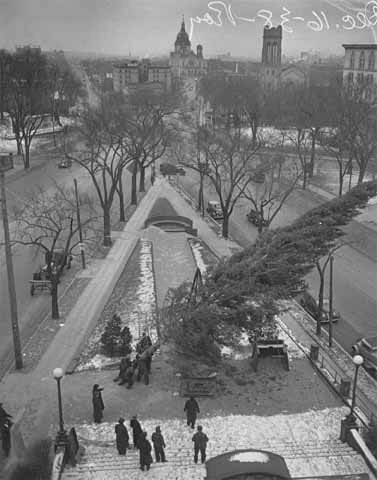 The triangle was traded to the park board by A. W. French and wife on January 1, 1900 in exchange for a piece of land they had originally donated for a parkway along Hennepin Avenue. The triangle was sold in 1966 to the Minnesota Highway Department to accommodate interchanges for I-94. The price tag was $24,300, plus the cost of relocating the Thomas Lowry Monument, which had stood on the triangle since 1915. Read much more about Virginia Triangle and the monument here. Walton Triangle. No property by this name was ever listed in the park board inventory or Schedule of Parks, but was included in the 1915-1916 proceedings in a schedule of wages for park keepers. Walton Triangle was included with Virginia Triangle, Douglas Triangle and Lowry Triangle and other properties in that neighborhood as the responsibility of one parkkeeper. This mysterious property likely got its name from Edmund Walton, a well-known realtor and developer, who lived on Mount Curve Avenue near where this property must have been located. This photo from the Brady-Handy Collection at the Library of Congress is almost certainly Eugene Wilson when he was a Congressman from Minnesota 1869-1871. The photo by Matthew Brady is identified only as Hon. [E or M] Wilson, but resembles very closely other images of Wilson. Wilson Park. Hawthorne Avenue and 12th Street North, 1.13 acres. The property was named Hawthorne Park when it was turned over to the park board by the city council April 27, 1883. Hawthorne Park was purchased by the city in 1882 for $15,503, of which $6,737 was donated and the remainder assessed against property in the district by the city council. The name was changed in 1890 to honor Eugene Wilson shortly after his death. 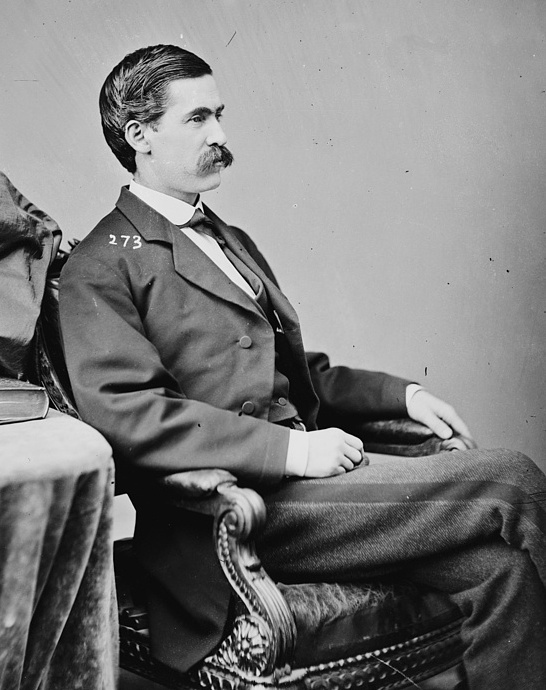 Wilson had been Mayor of Minneapolis, a congressman, a park commissioner and the park board’s first attorney. Wilson, one of the city’s leading Democrats, worked very closely with one of the city’s leading Republicans, Charles Loring, to secure the parkland we enjoy so much today. Good for them — and us. That’s the way government is supposed to work. Wilson Park was sold to the Minnesota Highway Department after a long fight in 1970. The exit ramps from I-94/394 into downtown behind the Basilica now pass over the lost park. Too bad we lost Eugene Wilson’s name in Minneapolis along with the park. He was one of the good guys. Other Losses to Freeways and Highways. I-94: Luxton, Riverside, Murphy Square, Franklin Steele Square, The Parade, Perkins Hill, and North Mississippi, as well as easements for bridges over East and West River Parkway. I-35W: Dr. Martin Luther King, Ridgway Parkway, Francis Gross Golf Course. The highway department also acquired an easement from the park board to build a bridge over Minnehaha Creek. I’ve only included properties that were officially acquired or improved, then later disposed of for some reason. The informal parks and playgrounds in empty lots that existed in many neighborhoods, but were never owned or improved by the park board, are not included. I’ve also left out small pieces of a few parks that were sold for various reasons over the years, other than those taken for highways. If you can add to or correct this list, please let me know. Do you remember anything about any of these former parks? If you do, please send me a note so we can preserve something of them. TRIVIA TEST. Here’s the Ph.D.-level park quiz question inspired by one of these entries. Two people had two completely different stretches of parkway named for them. One of those people was St. Anthony. (You could argue the parkways were named for the town, not the man, but this is my quiz.) The first parkway named for St. Anthony is now officially East River Parkway. 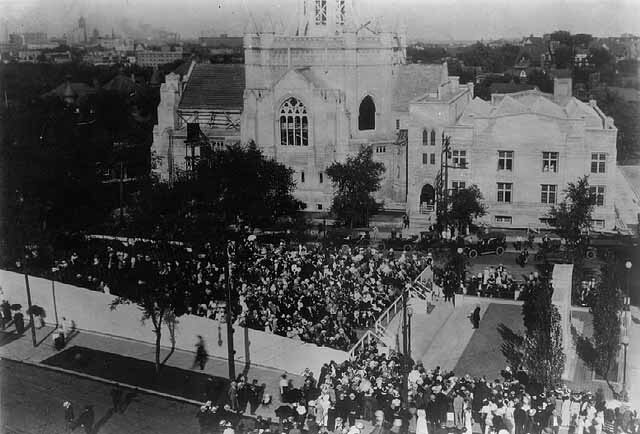 Later the name was given to the parkway across northeast Minneapolis. Name the other person who had two different parkways named for him. Only one of them still has his name. Several pioneer landscape architects were associated with Minneapolis parks, from H. W. S. Cleveland, in a very big way, to Warren H. Manning, more modestly, to Frederick Law Olmsted, who once wrote a letter to Minneapolis park commissioners at Cleveland’s request. But only one pioneer landscape architect was also elected to the Minneapolis Board of Park Commissioners: Phelps Wyman. (He never used his first name, Alanson, so I won’t either.) Wyman’s pioneer status in landscape architecture was determined by Charles A. Birnbaum and Robin Karson in Pioneers of American Landscape Design, which profiles about 150 American landscape architects. Wyman is also one of a very few landscape architects not employed by the Minneapolis park board to have had designs for Minneapolis parks published in annual reports of the park board. 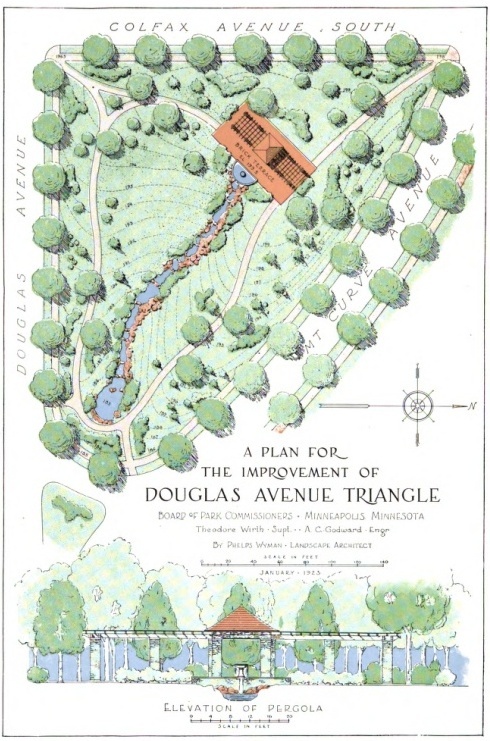 The 1922 annual report presented Wyman’s plan for Douglas Triangle, now Thomas Lowry Park, which I wrote about here. This plan was executed in 1923. Curiously, I can find no record that Wyman was paid for the work.